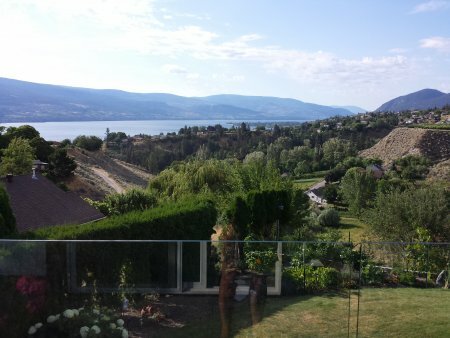 We have had enquiries and cancellations recently regarding the wild fires in the Okanagan. The media does tend to enlarge upon these things and don’t get me wrong! I am not negating the experiences of those who were closer to the fires than we were! 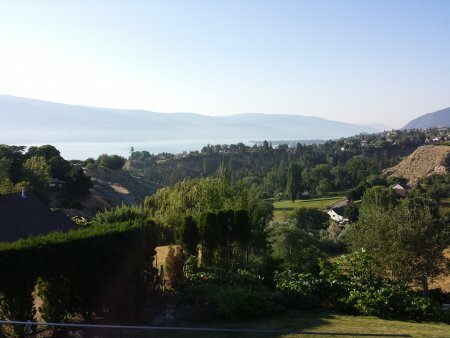 We had heavy smoke over the Lake, below our house, for 4 – 5 days this past week. It did not make outside breathing difficult but any type of exertion could be a little difficult, such as the Granfondo bike race which occurred during all this. I felt for those participants doing the whole 160 km. race! Due to the hard work of all the volunteer firefighters from all over the world, most of the fires have now been extinguished and we have no smoke over the lake since last Thursday. The pictures below were taken on Wednesday, 19th of July and on Thursday the 20th of July. Quite a difference! As well, I am happy to report that all highways from Alberta and from Vancouver are open and quite passable! No worries!